Villanova made a Final Four-record 18 three-pointers Saturday night and also became the most prolific three-point shooting team in college-hoops history, playing long ball to snuff out the Jayhawks early in a 95-79 victory. Junior wingman Eric Paschall led the barrage, going 4 for 5 from three, 10 for 11 overall, and finishing with a career-high 24 points. But the hoop was as wide as the Alamodome for pretty much everyone in a Wildcats jersey. Seven `Nova players made threes. 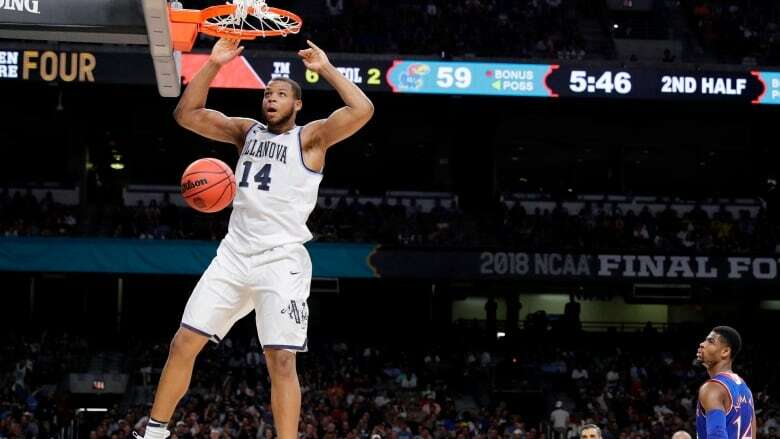 Villanova shot 50 per cent from behind the arc in the first half to put things out of reach — and 45 per cent for the game. "That happens sometimes when you're a good-shooting team and when you start that way," Villanova coach Jay Wright said. "It's hard for Kansas, it's hard to come back. That doesn't happen often. We're lucky it happened tonight." Nobody has had much success this season, and in what turned out to be an unexpectedly lopsided matchup between top seeds, Kansas (31-8) certainly didn't Saturday night. Player of the Year Jalen Brunson made three 3s and finished with 18 points. Omari Spellman made three, as well, in a 15-point, 13-rebound monster game. About 1 minute into the second half, Paschall drained a three for Villanova's 14th of the game, breaking a Final Four record first set by UNLV in 1987. Much earlier, at about the 13-minute mark of the first half, Collin Gillespie spotted up and swished for `Nova's sixth 3 of the game, which gave it the NCAA record for threes in a season, with 442. On Saturday, the typical Villanova possession involved working the ball down low on the wing, then a skip pass across the bottom of the paint, followed by one, two or three passes around the arc until somebody got open. It usually worked. Most of the 18 makes barely skimmed the net. Coach Bill Self did what he could, urging his 7-foot centre, Udoka Azubuike, out of the paint and into the faces of this group of hybrid forward-guards, all of whom can shoot. The big fella couldn't get there. The Jayhawks, back in San Antonio on the 10-year anniversary of winning their last title here, made mini runs, but the deficit never got below double digits. Devonte Graham, the senior guard who has been the glue in this Final Four season, led Kansas with 23 points. Malik Newman, who pushed his game into overdrive during the post-season, had 21. They combined to make 6 of 13 three-pointers themselves, but didn't get much help. 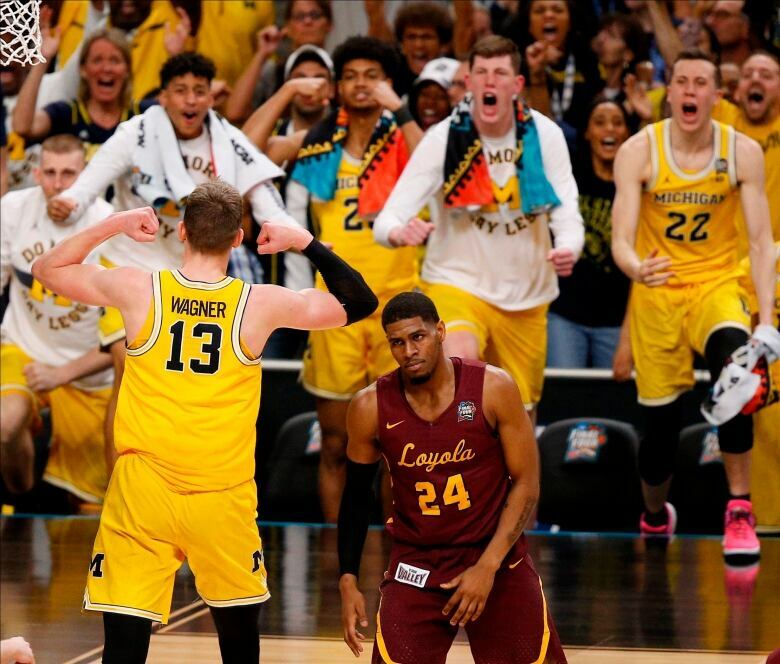 Staring down a 10-point deficit against an underdog that seemed nothing short of blessed during the madness of March, Moe Wagner and Michigan clamped down on Loyola-Chicago and ended one of the most memorable NCAA Tournament runs ever. Michigan will play either Villanova for its first NCAA title since 1989 on Monday night at the Alamodome. Loyola had no answers for the 6-foot-11 Wagner and its offence, so smooth and efficient on the way to San Antonio, broke down in the second half and finished with 17 turnovers. "I just tried to go in the game, take what the opponent is giving me, what the game is giving me, stay emotionally solid and don't get emotionally drunk, and it worked out today," said Wagner, who became the third player in the last 40 years with a 20 and 15 game in the Final Four, joining Hakeem Olajuwon of Houston in 1983 and Larry Bird of Indiana State in 1979.